More like ... greys' anatomy. Right? And therein lies the existential challenge for CBS, NBC, FOX, and ABC: How do you persuade advertisers to spend more on an audience that's so obviously graying faster than an already-graying country? You sell them on the purchasing power of senior citizens, I guess. In the 1993-94 broadcast season, Home Improvement was the most-watched show, with a median viewer of 34, Commercial Appeal reports. Today, it’s NCIS, with a median viewer who is 61. Not a three-year jump, or 13-year jump. A 27-year chasm. In one generation, the most popular show on broadcast has gone from targeting peak earners to targeting the average age of retirement. Half of the people watching NCIS, the most popular show on TV, are above America's average retirement age, according to Gallup. People wonder why the media doesn't pay attention to NCIS. Maybe it's because, axiomatically, the people paid to write about TV aren't retired. 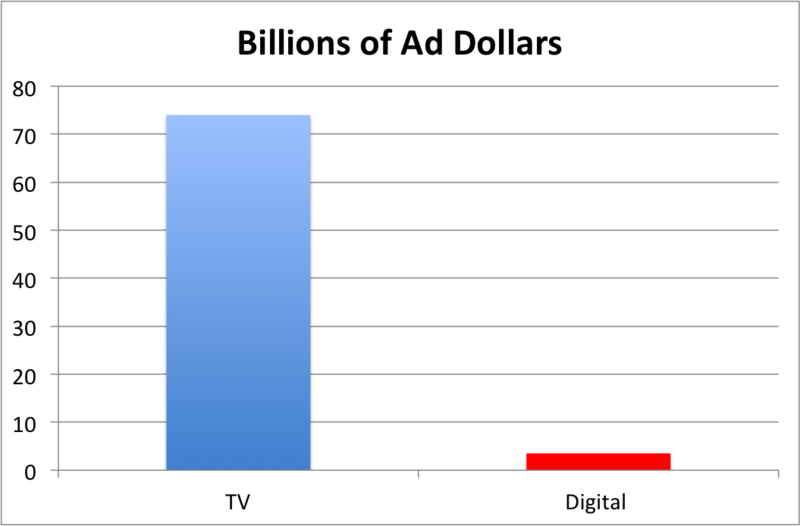 The bigger picture is that the TV industry is still a monster (see: graph below), and all this advertising isn't going away overnight. But one complicated byproduct of the explosion of video-watching options (the cable network, plus time-shifting, plus premium channels, plus Netflix/Hulu/Amazon, plus digital-only content like YouTube) is that even as we're watching more video than ever, advertising that's chasing a bunch of young live-viewers on the bigger screen are running short of non-sports options.